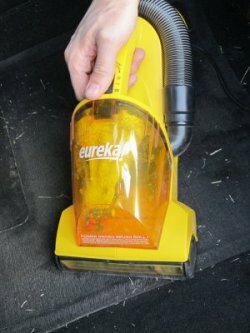 The Eureka 71B EasyClean Handheld is a handheld, corded vacuum cleaner. It features a 5.5 amp motor, strong suction relative to other handheld machines, and a stretch hose for more versatile cleaning ability. This machine is recommended for use cleaning cars, upholstery, stairs, and other tight spaces where traditional vacuums may have trouble reaching. From our experience, the Eureka 71B didn't work well in vehicles because of the shorter-than-ideal crevice tool and its inability to handle contours. However, we were overall very impressed by the continuous power of this corded machine and its versatility. 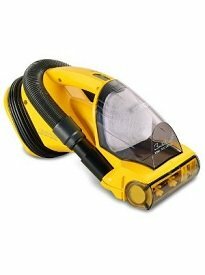 This utilitarian styled, black and yellow machine has incredible suction strength for a handheld and we loved the deep clean it gave our upholstery and carpets. While having a power cord limits your ability to grab and go, it was nice to never lose power and be able to tackle job after job. The risor-visor is a small plastic plate that flips down over the brushroll allowing you to use it vertically and horizontally. This bagless machine is a little messy to empty, which could be problematic for those suffering from asthma or allergies. But overall, we felt this Eureka handheld vacuum cleaner worked great on most jobs, is affordable and easy to use. 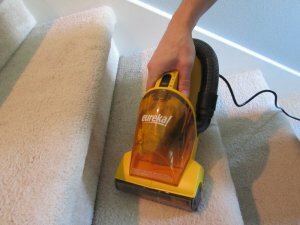 The suction of Eureka 71B hand vacuum is so powerful that you could feel it lifting dirt and debris from the carpet. As already mentioned, emptying the dust cup is a somewhat dirty ordeal. Additionally, we wished that the 71B had handled the contours of our vehicle better. However, it performed so well in other areas, that we were willing to overlook these shortcomings. The Eureka 71B Easy Clean has the option to clean just using the suction or with the brushroll. We found that when cleaning carpet, it always worked better to clean with the brushroll on. We began our test by putting the flour on our carpet to demonstrate the machine’s performance on fine particles. 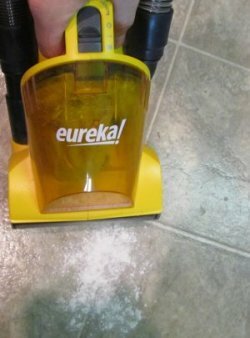 The Eureka Easy Clean had no trouble removing the flour from our carpet. Next, we tested the machine’s performance on medium particles using rice. Again, gathering the medium particles was not a problem for the Eureka 71B hand vacuum. The machine didn’t do as well with our larger white beans. We felt this was mainly because they didn’t fit through the brushroll very well. We found that on medium and large particles, you have to hover the machine slightly above the floor to allow enough clearance for the particles to get pulled under the machine. Using this handheld vacuum on hard surface flooring is one area where you can really feel the power of the suction. During testing on our vinyl flooring, we could literally feel the vacuum being sucked to the floor and we found it took some effort to pull it off. This small vacuum’s suction impressed us more than any other handheld thus far. Again, it did a great job on fine and medium particles, but struggled just a bit with large particles. We attributed this to the fact that the large particles had trouble fitting past the brushroll. After such a great experience using this machine to clean our home, we had high expectations for how it would preform in our vehicle. Sadly, we were disappointed. While it did a tremendous job cleaning flat surfaces, it didn’t work well on our car’s contours. Since this vacuum is corded, finding a place to plug it in can be a problem. The advantage is that the machine won’t lose power allowing you to clean your whole car or even clean multiple cars at once. As much as we love our animals, the hair they leave behind on our floor and furnishings is less than desirable. To see how this machine handled cleaning up after our pets, we rubbed dog hair into our upholster couch. The vacuum cleaned up the hair with ease, leaving our couch completely pet hair free. This machine is a great choice for those with pets. We used this vacuum on a few tasks before we tested the suction strength and had a suspicion that the suction was very strong. 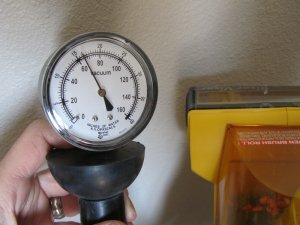 Using our water lift gauge, we tested the suction strength of the machine and were shocked to find that it was a seventy! Water lift is a measure of the suction produced by the motor and the average full-size vacuum has a water lift of seventy. The strong suction allows the machine to clean deeply. The filtration on this machine is acceptable, but nothing special. We tested the exhaust of the Eureka 71B handheld with our particle scanner to measure how many particles were being released back into the air and found that the count on the scanner went down slightly. The dirt cup and filter can be removed by pulling the power switch to the open cup position and lifting the cup off. The filter lifts out of the cup and the debris can be easily dumped into the garbage. We found this to be a messy experience. The filter is rinseable and must be allowed to dry completely before using it again. This machine has a detachable hose that can be used for cleaning edges and crevices. It wraps around the back of the machine and can be easily detached from the base for easy use. The crevice tool is stored in the base of the machine. It attaches to the hose for use on those places that are just too small for the brushroll to reach. Boxy in its design, this industrial looking, yellow and black machine is well balanced and comfortable on the wrist. The ability to use it vertically and horizontally takes away the need to maneuver the machine at odd angles providing a more comfortable cleaning experience. There is absolutely no set-up required for this machine. Simply remove the Easy Clean from the box, plug it in and you are ready to start cleaning. We tested the noise of this machine with the brushroll on. At an average of seventy-six point five decibels, this machine falls into our moderate category. We were impressed that such a small, powerful machine wasn’t louder. This machine mastered cleaning our stairs. The hose was easy to detach and use for cleaning around the edges. The plastic riser visor adjusts over the brushroll allowing you to clean vertical or horizontal surfaces with ease. The vacuum tended to “tug” slightly as we slid it across our carpeted stairs, but not so much that it was uncomfortable to use. We attributed it to the strong suction, you can really feel the power! The only possible drawback is the power cord. At twenty feet, the power cord was able to reach from one end of the stairs to the other without having to and find a new power outlet. However, if your stairs has a large landing or if you don’t have an outlet close to your stairwell, the power cord might not reach. Besides regularly changing the filter, cleaning out the brushroll and checking to ensure the hose is not clogged, we noticed one aspect of maintenance to pay particular attention to. When testing the Eureka 71B hand vacuum, we noticed that the fuller the dust cup was, the more clogged the filter was, resulting in a noticeably lower suction strength. In order to avoid this problem, we recommend regularly emptying out the dust cup and brushing off the filter. 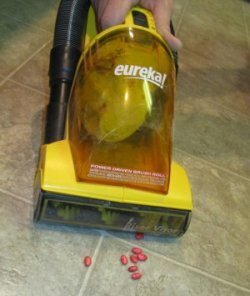 At around forty dollars to purchase, we feel this Eureka handheld vacuum is a good investment. We even found that some stores, such as Amazon, sold it for cheaper. 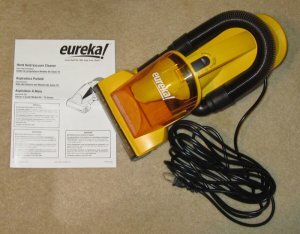 We liked the Eureka 71B hand vacuum. It does have some limitations and we wouldn’t recommend it for cars or allergy sufferers, but we enjoyed using it and felt that it did a great job cleaning. Cleaning Head Path 6 in.